Did they find PornHub? Possibly Brazzers? F: Ahh. Sweet sweet internet. Always something new. I love the look on his face. I like it! Eu amei os shows como uma criança ... Quem estou enganando? Eu ainda amo os shows! Eu gosto da obra de arte ... Mas eles são mais prováveis ​​por parte nu artístico de DA! Awesome crossover idea. Just awesome! omg that beavers show i loved that!now i cant watch it cause of that damn cable..
Desenho tá muito bom,são dois dos meus personagens favoritos! 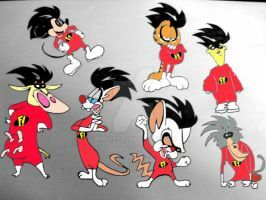 I loved Freakazoid when I was little.